Below is a message from the chair of SAFE, a new organization for flight instructors. It concerns a surprise meeting at FAA HQ that is the first step in what may become a major overhaul of the process for renewing a flight instructor certificate. Apparently, a key person at FAA flight standards wants to scrap FIRCs (I sort of agree with him on that) and require passing a knowledge test or even a practical test to qualify for renewal (I certainly don’t agree with those ideas). I’ve included the first of my comments to Doug below. Please send him your thoughts. We need to be proactive lest FAA come up with a new onerous and not very effective alternative (requiring a knowledge test will mean that folks like King Schools and Sporty’s offer a course with all the answers). I hope we’re careful about what criteria establish a CFI as “active.” Because I haven’t recommended a pilot for a practical test in many years, as far as the FAA is concerned, I’m not “active.” I would show up in FAA records as an active instructor only if I’ve endorsed the logbook of a pilot who is involved in an FAA investigation. But I stay busy giving flight reviews, IPCs, and, of course, stall/spin and aerobatic instruction. I’m also a FAASTeam representative, and I frequently give safety programs on behalf of FAA. None of those activities, however, count toward recognition for gold seal status, renewal of my certificate, or recognition as an active instructor. As you know well, Rich Stowell has never (to my knowledge) recommended a pilot for a practical test. But he engages in a many activities and initiatives dedicated to improving flight instruction. Perhaps as part of the renewal process, CFIs could report the time logged in the preceding 24 months as a CFI and the number of flight reviews, IPCs, and endorsements (tailwheel, high-performance, complex, spins) they’ve conducted. It might make sense to establish a currency standard—say, at least three flight reviews, or for a CFII, some number of IPCs and/or logged hours giving instrument instruction. This approach would echo the logging of flight time that all pilots must accomplish to carry passengers, carry passengers at night, fly under IFR, etc., and it would impose little burden or expense on CFIs (unlike the costs associated with certification as a master CFI). We already keep those records. And such a procedure would be similar to the process, as I understand it, for renewing an Inspection Authorization for a maintenance technician. The technician must report the number of annual inspections and other activities, including continuing education, he or she accomplished during the period prior to renewal. It might also be wise to follow a practice common in the insurance industry. I’m renewing the insurance for my Bonanza. To qualify for some discounts, I must submit completion certificates for specific AOPA ASI online courses. Surely the GA industry, with cooperation from AOPA ASI, SAFE, EAA, et al. could produce online courses, host webinars, etc. that would help establish that an instructor is actively engaged in training and keeping up with the latest information and techniques. Of course, as someone who gives many presentations on behalf of FAA, I think instructors should receive credit toward renewal (however that shakes out) for giving such presentations, not just for attending them. Evidence such as that outlined above would be a better indicator of an instructor’s activity and currency than just attendance at a FIRC or a series of DPE/CFI workshops. On November 29th, The FAA published a notice of a public meeting in the Federal Register under the subject, “Updating the Flight Instructor Renewal Process To Enhance Safety of Flight.” The meeting will be held on December 6-7, 2010 in Washington, DC. Information on this meeting follows, and is also available at http://edocket.access.gpo.gov/2010/2010-29921.htm. Several weeks ago, Greg French of AFS-800 invited me to represent SAFE at the meeting. He intimated that the meeting was to discuss the issue of FIRCs as well as the “entire way flight instructors can renew their certificates.” But it wasn’t until the announcement of the meeting in the Federal Register that I became aware of the actual agenda, or more importantly, of the meeting protocols and information on the submission of written materials presenting views or information. In preparing an official response from SAFE, it would be of great help if members would email any answers you want included in response to the questions provided below. I can then endeavor to prepare a cohesive and coherent SAFE response based on a consensus of answers I receive. Time is short, so please do not wait until the last minute to send me your thoughts. The FAA has been reviewing safety of flight data in the general aviation (GA) community over the last ten years. Even with the advent of new technologies to assist the GA pilot, there has been little improvement in the accident/incident rate among that community of aviators. CFIs are responsible for ensuring that pilots are properly educated to operate safely within the National Airspace System (NAS). For CFIs to accomplish that mission effectively they must be provided the means and knowledge to do so, and there must be some objective method of measuring that information transfer and retention. The FAA has been reviewing indicators that suggest that the processes currently in place may lack sufficient effectiveness in ensuring that CFIs are being provided the best information in the most useful manner. This meeting will elicit input from the community of authorized flight instructor renewal program operators so that the FAA can better analyze how to improve the process. The purpose of this public meeting is for the FAA to hear the public’s views and obtain information relevant to improving the CFI biennial renewal process. The FAA will consider comments made at this public meeting before making decisions on any suggested changes to the current policy. More specifically, the FAA seeks information on the following questions. The FAA requests that that all meeting participants provide written comments to support any positions they may express support for, or disagreement with. How effective have Flight Instructor Refresher Clinics been in transferring relevant information to flight instructors? What can be done to improve the effectiveness of flight instructor refresher clinics? How effective are the written tests provided at the conclusion of flight instructor refresher clinics? How can the effectiveness of flight instructor knowledge be better assessed? How effective have the online courses been? How do we effectively measure the success of knowledge transfer in online flight instructor renewal courses? Should there be changes to 14 CFR part 61.197? Are those non-FIRC methods of CFI biennial certificate renewal found in 14 CFR part 61.197 adequate and effective in ensuring that CFIs possess the most up to date information in terms of both proficiency and knowledge? What can the community conducting flight instructor recurrent training, the FIRC providers, do to contribute to enhancing safety of flight among the GA community at large? Again, time is short, so please do not wait until the last minute to send me your thoughts! The other day I departed Henderson, NV (KHND) on a local VFR instructional flight in an Extra 330LC. When my student and I arrived in the runup area, a Cessna 210 was idling nearby. Its pilot had been there a while, and he was carrying on an extended conversation with ground control about his IFR clearance to an airport in southern California. ATC had issued a complicated revision to his filed route. Because KHND abuts the Class B surface area for KLAS and is bounded by rapidly rising terrain to the east, south, and west, getting out of Henderson under IFR in a light aircraft can be challenging and time-consuming. We completed our pretakeoff checks and departed before the C210 pilot looked up from his kneeboard. We cleared the Class D airspace without hearing the tower clear him for takeoff. Similar situations exist at many other airports that lie within busy airspace, are not served by a SID, or have poor radar coverage. File an IFR flight plan before departure and use a VOR or other fix along your route as your “departure point” in block 5 of the flight plan form. Choose a fix that isn’t too close to busy airspace or a known arrival gate. Controllers working the sector around such airspace might be too busy to issue a clearance right away, and you might then have to hold under VFR until they can work you in. The filed ETD should be the time you expect to be over the fix you entered in block 5, not the time you plan to take off. I also enter “Departed XXXX” (where XXXX is the ID for the airport) in the remarks field to indicate the airport where I started the flight. Using this procedure, your filed flight plan probably won’t time out, even if you won’t ask for your clearance until a couple of hours after takeoff, because the departure time in the flight plan is based on the place and time where you expect to get your clearance, not when you took off from the departure airport. Using an appropriate en route fix, usually a VOR (but an RNAV waypoint or intersection can work, too) as the “departure point” helps ensure that the appropriate ATC facility gets your flight plan. As you approach the fix filed as your departure point, you can talk to approach or center, as appropriate, and they’ll almost always have your clearance readily available. If you’re already receiving VFR advisories, the controller may even offer the clearance to you before you ask. You can find (to a good approximation) the appropriate center frequency on an en route chart before you take off or in the “nearest” pages of your GPS while you’re en route. You can also find a center/approach frequency on an approach plate for an airport near the fix you specified as your departure point. An approach facility often owns the airspace below about 10,000 feet around airports with published procedures, so if you’re cruising at such altitudes, you may get your clearance from an approach controller, not someone at a center. If you need further help and haven’t noted the appropriate frequency before takeoff, contact flight service with your position, and they’ll give you a frequency to try. Back to the C210 at Henderson. 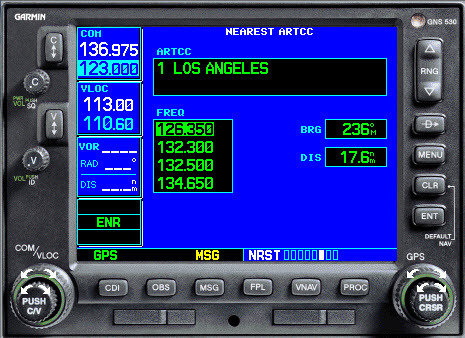 Given that the weather is usually good VFR in the Las Vegas area, a much better procedure for a flight into say, southern California, is to file an IFR flight plan with a “departure point” of, for example, DAG or PMD, and an ETD that accounts for the time you expect to need to fly from KHND to arrive over that fix. Here’s a routing into Long Beach that might work well. I also use this procedure often when flying from eastern WA or OR back into Seattle, where an IFR letdown is frequently required even when the skies are CAVU east of the Cascades. Having filed an IFR flight plan that begins over a fix such as YKM, I typically depart VFR from a non-towered airport (e.g., KBDN), and proceed toward YKM, where several airways and arrivals into the Seattle area begin. I call Seattle Center (if I’m not already getting flight following) 20-30 miles from YKM and my clearance is ready. The same procedure works when departing a towered airport, such as KGEG. In fact, because I file a VOR such as ELN as the departure point and my ETD is the time I expect to be over ELN, the tower probably won’t have an IFR flight plan for me, so no confusion ensues either when I depart, or when I request my clearance to Boeing Field from Seattle Center near Ellensburg. It’s important, of course, to use this procedure only when the weather allows a safe, comfortable departure and initial cruise under VFR. No scud-running that risks a CFIT accident. And you must make sure to contact ATC and receive an IFR clearance before you encounter IMC or fly beyond the fix you filed as your departure point. For more information about CFIT, see the Instrument Procedures Handbook (PDF) and the CFIT Safety Topic at the AOPA Air Safety Institute website. To learn about a related topic, Composite Flight Plans, see AIM 5-1-7. ASA recently published a brochure, Plotting Your Course, that helps answer common questions about learning to fly. It’s a terrific resource for flight instructors, flight schools, and people curious about learning to fly. The pamphlet has been available at many flight schools and FBOs (you can order free copies from ASA), and now Plotting Your Course is available as a free PDF download.